These mini artisan breads make a tasty side to any meal. Blended with Odyssey® Greek Yogurt, These single-serving mini loaves are the perfect size for dipping and dunking. 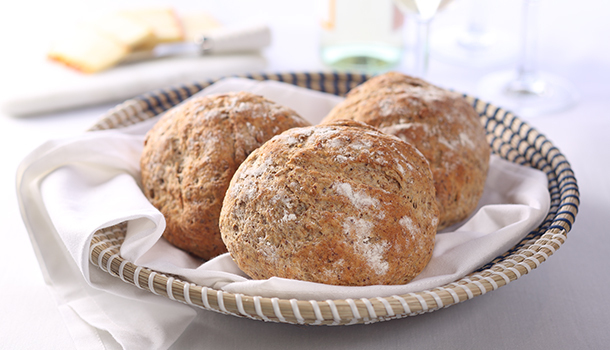 These tasty single-size loaves are the perfect side dish to any meal. Line 1 light-colored heavy non-stick rimmed sheet pan with parchment paper; set aside. To prevent bread bottoms from over browning, set the parchment lined sheet pan inside an unlined second pan. Baking with stacked pans gives needed insulation. In a large bowl of a stand mixer, add flours, flax, wheat bran, oats, sunflower seeds, sugar, yeast, salt and butter pieces; whisk to combine. Microwave water in a microwave safe glass measuring cup on high for about 55-60 seconds (temperature should be 120⁰F to 130⁰F); then whisk in Greek Plain Yogurt. Fit mixer with a dough hook and turn mixer on medium-low; gradually pour water mixture into dry ingredients. Knead for about 8-10 minutes. Dough should come together to form a ball shape but will still be slightly sticky. Coat a large mixing bowl with cooking spray and place the dough ball in the bowl; coat plastic wrap with cooking spray and cover bowl. Let rise in a warm place until dough doubles in size, about 1-1½ hours. Transfer risen dough onto a lightly floured surface and briefly knead. With a bench knife, divide dough into 4-equal portions. Briefly hand knead each portion and shape into round loaves. Place loaves on the prepared sheet pan several inches apart. Use a serrated knife and lightly cut 2-3 shallow lines in the top of each loaf. Coat plastic wrap with cooking spray and lightly cover breads. Let rise in a warm place for about 1 hour. Place oven rack in center of oven and preheat oven to 400⁰F. Bake bread until done, about 25-30 minutes. Cool on a wire rack.